2017-10-22 Assigned to THOMSON LICENSING S.A. reassignment THOMSON LICENSING S.A. ASSIGNMENT OF ASSIGNORS INTEREST (SEE DOCUMENT FOR DETAILS). Assignors: THOMSON CONSUMER ELECTRONICS, INC.
2017-12-07 Assigned to THOMSON LICENSING reassignment THOMSON LICENSING ASSIGNMENT OF ASSIGNORS INTEREST (SEE DOCUMENT FOR DETAILS). Assignors: THOMSON LICENSING S.A.
An exemplary video encoder is disclosed that quantizes pel blocks of a video signal based upon one or more of the following: (i) an actual bit distribution of a previously encoded video frame, (ii) a required decoding delay for a splice point, and (iii) an activity measure of a pel block being encoded. Moreover, an exemplary video encoder uses the above quantization techniques to obtain an encoded video stream having seamless in points and seamless out points. Video encoding methods that utilize the above quantization methods are also disclosed. This application is a divisional of application Ser. No. 09/394,358, filed Sep. 10, 1999. This invention was made with Government support under Contract No. 70NANB5H1174 awarded by the National Institute of Standards and Technology. The Government has certain rights in this invention. An exemplary method of encoding a video signal according to the present invention calculates the quantization requirements for a first video signal into which a second video signal will be spliced, according to the volume of coded information of both video signals. FIGS. 4A-4C show a flowchart of a rate control method used by the video encoder of FIG. 1. FIG. 8 shows a general processing system suitable for implementing the video encoder of FIG. 1. FIG. 1 illustrates a block diagram of video delivery system  100. In particular, the video delivery system 100 includes a video source 102, a compressed video encoder 104, and a distribution network 106. In general, the video source 102 is operable to generate a video signal having a series of video frames or picture and may be implemented with, for example, a digital video camera that produces a series of digital video frames. The compressed video encoder  104 is operable to compress the video signal produced by the video source 102 and to format the compressed video signal for delivery over the distribution network 106. The distribution network 106 in general delivers the compressed video signal to video receivers (not shown) which in turn decompress and display the video signal. It should be appreciated that the distribution network 106 may be implemented using various communication technologies and topologies such as CATV distribution networks, satellites, television antennae, to name but a few. Referring to FIG. 1 in more detail, the compressed video transmitter  104 includes a video input buffer 112, a video encoder 114, and a transport stream encoder 116. The video input buffer 112 is operable to buffer video frames produced by the video source 102 until the video encoder 114 is able to encode the video frame. Moreover, the transport stream encoder 116 is operable to receive a compressed video stream from the video encoder 114, format the stream according to, for example, a MPEG system level protocol, and multiplex the formatted video stream with an associated audio stream and other encoded video streams. In this manner, the transport stream encoder 116 is operable to provide video receivers (not shown) coupled to the distribution network 106 with multiple programs from which to choose. Except for the Rate Control element, the compression and formatting circuitry is similar to known circuitry, such as is described in the articles DIGITAL TERRESTRIAL HDTV FOR NORTH AMERICA: THE GRAND ALLIANCE HDTV SYSTEM or MPEG2 VIDEO CCODEC USING IMAGE COMPRESSION DSP, both of which are found in IEEE Transactions on Consumer Electronics, Vol. 40, No. 3, August 1994, and thus will not be described in detail. Suffice it to say that the video encoder  114 is generally operable to encode video frames, provided from the buffer 112, in such a manner that the encoded video frames are represented with less bits than the original video frame To this end, the video encoder 114 includes a DCT unit 118, a quantizer 120, a Huffman encoder 122, and a video output buffer 124. The DCT unit 118 generally performs an 8×8 discrete cosine transform upon each 8×8 pel block of a video frame to generate 8×8 blocks of DCT coefficients that represent the frequency information contained in the original 8×8 pel block. The frequency information is typically concentrated in a few DCT coefficients in respective blocks with the remaining DCT coefficients being close to or equal to zero. Furthermore, the exemplary embodiment of video encoder  114 illustrated in FIG. 1 includes an inverse quantizer 126 receiving input from the quantizer 120 output. The inverse quantizer 126 output is coupled to an inverse DCT unit 128, which in turn is an input to summing node 129. Summing node 129 output is coupled as input to a motion compensation unit 130. The motion compensation unit 130 also receives an input from the output of the video input buffer 112. The motion compensation unit 130 provides an output and is coupled to the Huffman Encoder 122, summing node 117, and summing node 129. Summing node 117 receives a second input from the video input buffer 112 and its output is coupled as an input to the DCT unit 118. The quantizer  120 operates to quantize the 8×8 DCT block based upon a programmable quantization value Qstep. As a result of quantizing the 8×8 DCT block, more of the DCT coefficients become equal to zero. A further consequence of quantization is that the remaining nonzero DCT coefficients converge to fewer possible values. The greater the quantization value Qstep the fewer possible values to which the DCT coefficients may converge and the fewer number of bits needed to represent the 8×8 DCT block. Accordingly, by adjusting the quantization value Qstep, the quantizer 120 effectively controls the number of bits required to represent the video signal. A variable length encoder e.g., a Huffman encoder 122, variable length encodes the resulting quantized DCT blocks. The intraframe and interframe coding techniques performed by the encoder  114 produce different quantities of output data for each encoded video frame. However, since the encoded video signal is ordinarily transmitted by the transport stream encoder 116 at a constant bit rate (CBR), the video encoder 114 may include a video output buffer 124 in order to buffer the difference between the (CBR) transmission and the variable bit rate (VBR) encoding of the video frames. The quantizer is controlled by a rate control processor  119 which implements a rate control method 400 that is described in detail below in reference FIGS. 4A-4C. The rate control processor 119 essentially increases the quantization value Qstep of the quantizer 120 in order to reduce the fullness level of the video buffers. Conversely, the rate control algorithm essentially decreases the quantization value Qstep of the quantizer 120 in order to increase the fullness level of the video buffers. In an exemplary embodiment of the present invention, the rate control processor 19 utilizes actual bit distributions of previously encoded video frames in order to better predict the number of bits required to encode a current video frame. Moreover, the rate control processor 119 in an exemplary embodiment further takes into account the complexity of a pel macroblock when adjusting the quantization value Qstep used to encode the pel macroblock. More specifically, the rate control processor 119 attempts to allocate more bits to complex macroblocks and less bits to less complex macroblocks. In this manner, the rate control processor 119 attempts to achieve encoded video frames having a better distribution of bits and a better image quality than encoded video frames produced by other video encoders. During splicing of program material, the rate control processor  119 of the exemplary video encoder 114 operates across a larger set of video frames than previous rate control methods. In particular, the rate control processor 119 of the exemplary video encoder 114 operates across multiple groups of pictures (GOPs) whereas prior rate control methods operated across only a single GOP. By spreading the rate control operation across more GOPs, the video encoder  114 of the exemplary embodiment attempts to achieve encoded video frames having better image quality than video encoders were able to achieve with prior rate control methods. Spreading the rate control operation across multiple GOPs is especially useful in achieving an encoded video stream having seamless splice points. A large adjustment to the quantization value Qstep may be required if only a single GOP were used to achieve the buffer fullness level required for a seamless splice point. This large adjustment may greatly decrease the image quality of the video frames of the GOP. However, by spreading the adjustment to the quantization value Qstep across multiple GOPs, a less dramatic adjustment to the quantization value Qstep may be achieved thus resulting in better overall and consistent image quality for the encoded video stream. As defined by the MPEG-2 standard a GOP is a basic access unit comprising one I-frame as an entry point and one or more P-frames and B-frames. FIG. 2 illustrates exemplary N=9, M=3 GOPs GOP 1 and GOP2 in both presentation order and encode/decode order. In particular, the exemplary GOPs GOP1 and GOP2 each include nine (N=9) video frames of which every third (M=3) video frame is an anchor video frame (I-frame or P-frame). Each macroblock of an I-frame is intraframe encoded. Accordingly, a video stream decoder may decode an I-frame (e.g. I3 and I12) without reference to other video frames of the video stream. Each macroblock of a P-frame, however, may be intraframe encoded or interframe encoded based upon a prior reference video frame (in the sense of presentation order) which may be either an I-frame or P-frame. Accordingly, in order to decode a P-frame, a video decoder must first decode the appropriate reference video frame for the P-frame. The transmission order of frames is seen to be different from the display order. For example, the P-frame P 6 is transmitted prior to the B-frame B4 even though the B-frame B4 is displayed prior to the P-frame P6. This is necessary because the decoder must decode the P-frame P6 prior to decoding B-frame B4. While a B-frame may be interframe encoded based upon a past reference video frame, the video encoder 114 preferably interframe encodes B-frames preceding a splice-in point in presentation order (e.g. B-frames B10 and B11) based solely on future video frames (e.g. I-frame I12) so that the interframe encoded B-frames are not dependant upon a previous GOP and may be decoded after entering the video stream at the splice in point. Shown in FIG. 3 is a simplified flowchart of an exemplary encoding method implemented by the video encoder  114 of the present invention. In encoding a video signal, the video encoder 114 commonly implements a repetitive GOP structure such as the N=9 M=3 GOP structure depicted in FIG. 2. The flow chart is generally self explanatory to those skilled in the art of compressed video signal processing, and will be described only briefly with the exception of step 310 GENERATE QUANTIZATION VALUE Qstep, to effect rate control. Beginning with step  302, a frame (F) of the digital video signal is selected for encoding. In accordance with step 303 a current macroblock count (j) is initialized for the selected frame (F). In accordance with with step 304, PEL macroblock (MB) is selected from selected frame (F). Step 306 involves an evaluation as to whether or not frame (F) is to be intraframe decoded. If frame (F) will not be intraframe decoded, then in accordance with step 307, the motion compensation unit is enbabled. If, however, frame (F) is to be intraframe decoded, then in accordance with step 308, the motion compensation unit is disabled. In accordance with step  309, a DCT transformation is performed upon the current macroblock (MBj). A quantization value (Qstepj) is then generated for current macroblock (MBj), in accordance with step 310. In accordance with step 312, the tranformed macroblock (MBj) is then quantized based upon the generated quantization value (Qstepj). The quantized transformed macroblock (MBj) is then variable length encoded, in accordance with step 314. In accordance with step 316, the encoded macroblock (MBj) is then reconstructed for the motion compensation unit. Step 318 involves an evaluation as to whether or not the last macroblock MBMBent of selected frame (F) has been encoded. If the last macroblock MBMBent of selected frame (F) has been encoded, then the process begins anew at step 302 for the next frame. If however, the last macroblock MBMBent of selected frame (F) has not been encoded, then in accordance with step 320 the current macroblock count (j) for the selected frame (F) is updated and process is resumed at step 304. Shown in FIGS. 4A, 4B, and  4C are flowcharts of a rate control method 400 implemented by the rate control processor 119. In general, the rate control method 400 causes the rate control processor 119 to adjust the quantization value Qstepj of the quantizer 120 in order to maintain the video buffers at a desired fullness level. The rate control processor 119 in implementing the rate control method 400 adjusts the quantization value Qstepj for each pel macroblock MBj based upon (i) bit distributions of previously encoded video frames, (ii) complexity of the macroblock being encoded, and (iii) an estimated fullness level of the video buffers. In step  402, the rate control processor 19 determines whether the video encoder 114 has previously encoded a video frame of the video signal that is of the same frame type as the selected video frame F. If the selected video frame F is an anchor frame (e.g. an I-frame or a P-frame), then the rate control processor 119 determines in step 402 whether the video encoder 114 has previously encoded an anchor frame. 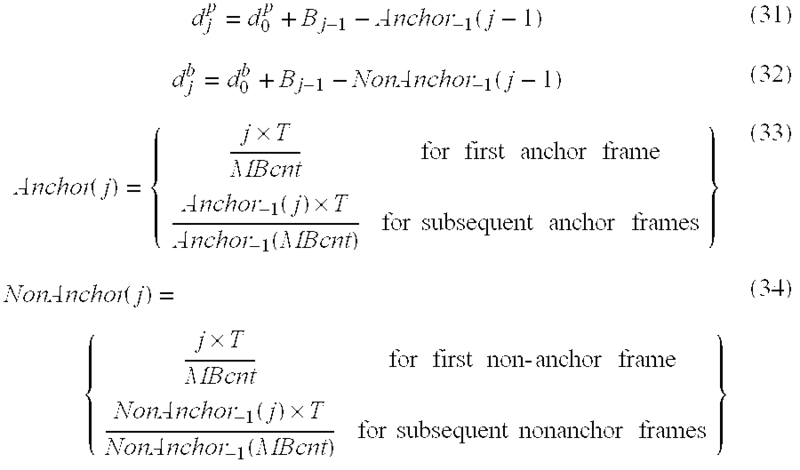 Similarly, if the selected frame F is a non-anchor frame (e.g. a B-frame), then the rate control processor 119 in step 402 determines whether the video encoder 114 has previously encoded a non-anchor frame. If the rate control processor  119 in step 402 determines that the video encoder 114 has not encoded a frame of the same frame type as the selected video frame F, then the rate control processor 119 proceeds to step 404 of FIG. 4B. Conversely, if the rate control processor 119 in step 402 determines that the encoder 114 has encoded a frame of the same frame type as the selected video frame F, then the rate control processor 119 proceeds to step 440 of FIG. 4C. Referring now to FIG. 4B, the rate control processor  119 in step 404 determines whether the selected pel macroblock MBj is the first pel macroblock MB1 of the selected frame F. In an exemplary embodiment, processor 119 determines that the selected pel macroblock MBj is the first pel macroblock MB1 of the selected video frame F if the current macroblock count j for the selected video frame F is equal to 1. If the rate control processor 119 in step 404 determines that the selected pel macroblock MBj is the first pel macroblock MB1 of the selected video frame F, then processor 119 proceeds to step 406 in order to initialize various parameters. Conversely, if the selected pel macroblock MBj is not the first pel macroblock MB1 of the selected video frame F, then the rate control processor 119 proceeds to step 419.
where K p and Kb are constants that are dependent on the quantization matrices used to quantize pel macroblocks. 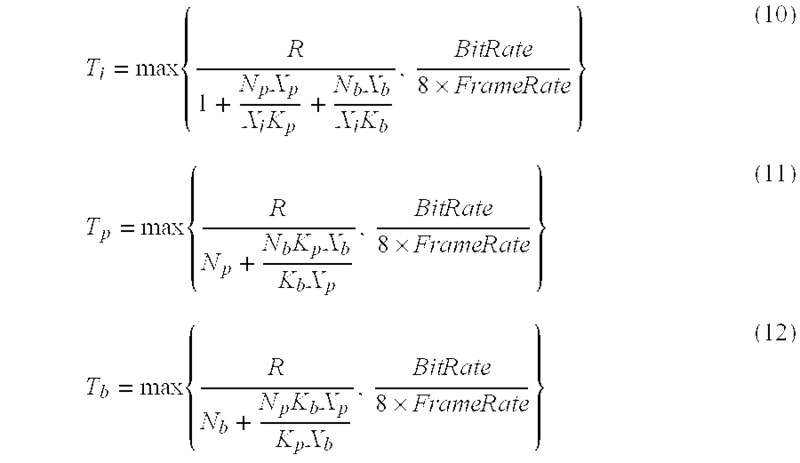 For example, the constants Kp and Kb are commonly set equal to 1.0 and 1.4, respectively when the quantization matrices defined by the MPEG-2 Test Model 5 are being used. After setting the respective initial buffer fullness level d 0 i, d0 p, and d0 b, the processor 119 determines (step 408) whether the selected frame F is the first frame of the current GOP GOPn being encoded. Accordingly, the rate control processor 119, in an exemplary embodiment, determines that the selected video frame F is the first video frame of the current GOP GOPn based upon whether the video encoder 114 is I-frame encoding the selected frame F. If the video encoder 114 is I-frame encoding the first video frame of the current GOP GOPn, then the rate control processor 119 proceeds to step 410 in order to initialize a remaining number of bits R for the current GOP GOPn. Otherwise, the rate control processor 119 proceeds to step 412 in order to update the remaining number of bits R for the current GOP GOPn. where N is equal to the total number of frames in the GOP, and R Gprev is equal to the remaining number of bits R of the previously encoded GOP GOPn−. If the current GOP GOPn is the first GOP GOP1, the remaining number of bits RGprev is equal to zero. Furthermore, if the video encoder 114 used more than the allocated remaining number of bits R to encode the previous GOP GOPn−1, the remaining number of bits RGprev is a negative number. Alternatively, if the video encoder 114 used less than the allocated remaining number of bits R to encode the previous GOP GOPn−1, then the remaining number of bits RGprev is a positive number. where R prev is equal to the remaining number of bits for the current GOP GOPn prior to encoding the selected video frame F, and S is equal to the total number of bits used to encode the previous video frame of the current GOP GOPn. The rate control processor  119 then in step 416 initializes an average activity measure avg_act, for example 400. If the processor  119 determined (step 404) that the current pel macroblock MBj to be encoded is the first pel macroblock MB1 of the selected frame F, then the processor 119 initializes (step 418) a target error value ΔTj for the selected frame F. More specifically, in an exemplary embodiment, it sets the target error value ΔTj equal to zero in order to initialize the target error value ΔTj for the selected video frame F.
where B j−1 represents the total number of bits used to encode the pel macroblocks of the selected video frame F up to but not include the current pel macroblock MBj, MBcnt represents the total number of macroblocks of the selected video frame F, j represents the current macroblock count, and T represents the target number of bits Tj, Tp, or Tb allocated to the selected video frame F.
where P k n represent the kth pel value of the nth sub-block of the field or frame organized pel macroblock MBj. where the min( ) function obtains the smallest block variance vblk n of the current pel macroblock MBj. where T represents the respective target number of bits T i, Tp, or Tb for the selected video frame F, and ΔTj represents the target error value for the current pel macroblock MBj. Modulating the reaction parameter rj in the above manner, results in stronger quantization being performed on less complex macroblocks than on more complex macroblocks. By quantizing less complex macroblocks more strongly than complex macroblocks when more bits have been used than estimated, the video encoder 114 is generally able to obtain better image quality than prior video encoders. where d 0 i, d0 p, or d0 b represent the buffer fullness level of the respective target buffer prior to encoding the current pel macroblock MBj, and T j represents the target error value for the current pel macroblock MBj. where r j represents the reaction parameter for the current pel macroblock MBj and dj represents the buffer fullness level dj i, dj p, or dj b for the respective type of video frame encoding being used to encode the selected video frame F.
where N_act j represents the normalized activity measure for the current pel macroblock MBj. Moreover, the rate control processor 119 constrains the quantization value Qstepj to the range of integers between and including 1 and 31. The rate control processor  119 then in step 436 provides the quantizer 120 with the obtained quantization value Qstepj in order to cause the quantizer 120 to quantize the current pel macroblock MBj based upon the obtained quantization value Qstepj. The rate control processor  119 then in step 438 updates the respective initial buffer fullness level d0 i, d0 p, or d0 b for the next pel macroblock of the respective type of video frame encoding being used to encode the selected video frame F. In particular, the rate control processor 119 in an exemplary embodiment sets the initial buffer fullness level d0 i, d0 p, or d0 b for the next pel macroblock equal to the respective buffer fullness level dj i, dj p, or dj b for the current pel macroblock MBj. After providing the quantizer  120 with an appropriate quantization value Qstepj and updating the respective initial buffer fullness level, the rate control processor 119 stops executing the rate control method 400 until the next pel macroblock is encoded. Referring now to FIG. 4C, if the rate control processor  119 in step 402 determines that a frame has been encoded using the same type of frame encoding as the video encoder 114 is using to encode the selected frame F, then the rate control processor 119 in step 440 determines whether the selected pel macroblock MBj is the first pel macroblock MB1 of the selected frame F. It does this in the same manner as in step 404. More specifically, in an exemplary embodiment it determines that the selected pel macroblock MBj is the first pel macroblock MB1 if the current macroblock count j for the selected video frame F is equal 1. If it is the first pel macroblock MB1 of the selected frame F1 then the rate control processor 119 proceeds to step 442; otherwise, the rate control processor 119 proceeds to step 459. In step  442, the rate control processor 119 determines whether the selected video frame F is the first video frame of the current GOP GOPn, being encoded. If the selected video frame F is the first video frame of the current GOP GOPn, then the rate control processor 119 proceeds to step 444 in order to initialize a remaining number of bits R for the current GOP GOPn. Otherwise, the processor 119 proceeds to step 446 in order to update the remaining number of bits R for the current GOP GOPn. After determining that the video encoder  114 is encoding the first video frame of the current GOP GOPn, the rate control processor 119 in step 444 initializes the remaining number of bits R for the current GOP GOPn. Specifically, the video encoder 114, in an exemplary embodiment, initializes the remaining number of bits R for the current GOP GOPn based upon the above GOP allocation initialization equation (5). However, if video encoder  114 is not encoding the first frame of the current GOP GOPn, then the processor 119, in step 446, updates the remaining number of bits R for the current GOP GOPn, where R is determined according to equation (6). where S I, Sp and Sb represent the number of bits generated in order to encode the previous I-frame, or P frame or B frame respectively. Moreover, in (24), (25), and (26), Qi represents the average quantization parameter for the previous I-frame which is computed by averaging the actual quantization values used to encode the previous I-frame, Qp represents the average quantization parameter for the previous P-frame which is computed by averaging the actual quantization values used to encode the previous P-frame including the skipped macroblocks, and Qb represents the average quantization parameter for the previous B-frame which is computed by averaging the actual quantization values used to encode the previous B-frame including the skipped macroblocks. Then in step  450, the processor 119 allocates a target number of bits Ti, Tp, or Tb to the selected video frame F. More specifically, the rate control processor 119 allocates the respective target number of bit Ti, Tp, or Tb based upon the above video frame allocation equations (10), (11), and (12). Then, the rate control processor  119 obtains in step 452 an actual bit distribution for a previously encoded video frame of the same frame type (e.g. anchor, non-anchor) as the selected video frame F. The rate control processor 119 analyzes the previously encoded video frame of the same frame type to obtain the actual number of bits ABx used to encode each pel macroblock MBx of the video frame. where S represents the total number of bits S a, or Sn used to encode the previous anchor or non-anchor video frame of the video signal, and T represents the target number of bits Ti, Tp, Tb for the selected video frame F.
where MBcnt prev represents the number of macroblocks included in the previously encoded video frame, and each of act1 prev, act2 prev, . . . act MB — cnt prev prev represents a spatial activity measure of a respective macroblock MB1 prev, MB2 prev, . . . MBMB — cnt prev prev of the previously encoded video frame. If the processor  119 determined, in step 440, that the current pel macroblock MBj is the first pel macroblock MB1 of the selected frame F, then the processor 119 in step 458 initializes a target error value ΔTj for the selected frame F. More specifically, the target error value ΔTj is set equal to zero. where B j−1 represents the total number of bits used to encode the pel macroblocks of the selected frame F up to but not including the current pel macroblock MBj, j represents the current macroblock count, and each NABx represents a normalized actual number of bits of the normalized actual bit distribution. After obtaining the target error value ΔT j for the current pel macroblock MBj, the rate control processor proceeds to step 420 to obtain the quantization value Qstepj for the pel macroblock MBj. More specifically, due to the target error value ΔTj being based upon the normalized actual distribution of a previously encoded video frame of the same frame type as the selected frame F, the processor 119 by returning to step 420 of the rate control method 400 obtains a reaction parameter rj and a quantization value Qstepj that are based upon the actual bit distribution of the previously encoded frame. where B j−1 represents the actual number of bits used to encode up to the current macroblock MBj, Anchor−1(j) represents the total number of bits used to encode the previous anchor frame up to the macroblock MBj, Anchor−1(MBcnt) represents the total number of bits used to encode the previous anchor frame, NonAnchor−1(j) represents the total number of bits used to encode the previous non-anchor frame up to the macroblock MBj, NonAnchor−1(MBcnt) represents the total number of bits used to encode the previous non-anchor frame, and d0 i, d0 p, and d0 b represent the current levels of the respective buffer fullness levels dj i, dj p, and dj b. The splice point decoding delay SpliceDecodingDelay for a particular video frame is directly related to the buffer fullness level. To realize the requisite buffer fullness level at the splice in point, the video encoder  114 must have tight control over the number of bits used to encode the video frames prior to the splice in point. The video encoder 114 utilizes a slightly modified version of the rate control method 400 to achieve the SMPTE 312M defined splice point decoding delay for each seamless video in point. In particular, the rate control processor 119 determines a target correction factor TargetCorrectionn for the GOP GOPn, and allocates a remaining number of bits R to the current GOP GOPn based upon the target correction factor. Referring now to FIG. 6, there is depicted an in point GOP allocation method which initializes the remaining number of bits R for a GOP or a group of GOPs that precede a desired splice in point SIP m based upon a target correction factor TargetCorrectionx for each preceding GOP GOPx. More specifically, the above steps 410 and 444 of the rate control method 400 which initialize the remaining number of bits R are replaced with the in point GOP allocation method. The GOP allocation method begins in step 602 with the rate control processor 119 initializing a remaining number of bits R for the current GOP GOPn. The remaining number of bits R for the current GOP GOPn are based upon the above GOP allocation equation (5). The rate control processor  119, in step 603, then identifies the next desired splice in point SIPm. The processor 119 receives splice in point configuration information from a user that identifies desired loctions in the encoded video stream for seamless splice in points. For example, the splice in point configuration information may indicate that splice in points should be placed at 1 minute intervals with several additional splice in points temporally concentrated about typical commercial break points of a television program. After identifying the next desired splice in point SIP m, the rate control processor in step 604 determines whether the remaining number of bits R for the current GOP should be adjusted in order to achieve a required decoding delay at the splice in point SIPm. More specifically, the rate control processor 119 in step 604 determines whether the current GOP GOPn precedes the desired splice in point SIPm and whether the current GOP GOPn contains a splice in point SIPx. It should be appreciated that except for the GOPs following the last splice in point SIP Last of a bit stream, each GOP GOPx of the bit stream precedes at least one splice in point of the bit stream. Accordingly, in order to limit the number of GOPs affected by the target correction factor TargetCorrectionn, the rate control processor 119 utilizes a user definable GOP limit which limits the determination to a specific number of GOPs preceding the desired splice in point SIPm. For example, if the user definable GOP limit is set to a value of three, then the rate control processor 119 would limit the determination to GOPs within three GOPs of the desired splice in point SIPm. Accordingly, if a desired splice in point SIPm were not within three GOPs of the current GOP GOPn, then the rate control processor 119 in the exemplary embodiment would determine that the remaining number of bits R for the current GOP GOPn need not be adjusted. If the remaining number of bits R for the current GOP GOP n does not need adjusting, the processor 119 exits the GOP allocation method and returns to the rate control method 400 of FIGS. 4A-4C. If the remaining number of bits R does not need adjusting, the rate control processor 119 in executing the GOP allocation method essentially allocates the same remaining number of bits R to the current GOP GOPn as steps 414 and 444 of the method 400.
where DecodingDelay 1 represents the decoding delay of the first video frame of the video stream, SlPframe# represents the encode/decode video frame number of the splice in point SIPm, CurrentFrame# represents the encode/decode video frame number of the selected video frame F, RGprev represents the number of bits R allocated to the previous GOP GOPn−1 that are still remaining after encoding the previous GOP GOPn−1, and BitCount represents the total number of bits used to encode the video stream up to the current GOP GOPn. where B is a calibration constant which attempts to ensure that the resulting decoding delay DecodingDelay IP for the SIPm is greater than the required splice point decoding delay SpliceDecodingDelay. In this manner, video stream decoder 114 may later insert stuffing bits in order to achieve the required splice point decoding delay SpliceDecodingDelay. Moreover, RemGOPs in above equation (36) represents the remaining number of GOPs to be encoded before the splice in point SIP m. For example, in determining the target correction factor TargetCorrectionn for the third GOP GOP3 of FIG. 5, the remaining number of GOPs RemGOPs before the second splice in point SIP2 would be equal to three since the rate control processor 119 may adjust the remaining number of bits R for each of the GOPs GOP3 GOP4 and GOP5 in order to achieve the required splice point decoding delay SpliceDecodingDelay at the second splice in point SIP2. Similarly, in determining the target correction factor TargetCorrectionn for the fourth GOP GOP4 of FIG. 5, the remaining number of GOPs RemGOPs before the second splice in point SIP2 would be equal to two since the rate control processor 119 may now only adjust the remaining number of bits R for each of the GOPs GOP4 and GOP5 in order to achieve the required splice point decoding delay SpliceDecodingDelay at the second splice in point SIP2. where R 0 represents the remaining number of bits originally allocated to the current GOP GOPn in step 602, and TargetCorrectionn−1 represents the target correction factor used with the previous GOP GOPn−1 of the video signal. The target correction factor TargetCorrectionn−1 in an exemplary embodiment is set equal to zero if the current GOP GOPn is the first GOP GOP1 of the video signal. Moreover, it should be appreciated that the previous target correction factor TargetCorrectionn−1 is subtracted from the remaining number of bits R for the current GOP GOPn in order to maintain the constant bit rate encoding properties of the video encoder 114. After obtaining the adjusted remaining number of bits R for the current GOP GOP n, the rate control processor 119 exits the in point GOP allocation method. Moreover, the rate control processor 119 returns to the rate control method 400 to obtain a quantization value Qstepj for the current pel macroblock MBj based upon the adjusted remaining number of bits R for the current GOP GOPn. where BitCount represents the total number of bits used to encode the video stream up to the splice in point SIP m.
where NumStuffingBits represents the number of stuffing bits required in order to achieve the required splice point delay SpliceDecodingDelay for the splice in point SIP m to be a seamless in point. The MPEG standard limits the number of stuffing bits which may be added. If the required splice point delay SpliceDecodingDelay cannot be achieved with stuffing bits, the video encoder  114 marks the splice in point SIPm as a non-seamless splice in point. For example, the P-frame P 6 of FIG. 2 is the last video frame in presentation order before the second splice out point SOP2. However, the B-frames B4 and B5, which precede the P-frame P6 in presentation order, follow the P-frame P6 in decode/encode order. The last payload byte of the out point packet containing the second splice out point SOP2 corresponds with the B-frame B5. Therefore, in order to satisfy the above second constraint for an out point at the P-frame P6, the decoding delay DecodingDelay(Last Byte of B5) for the last byte of the B-frame B5 must be equal to the splice point decoding delay SpliceDecodingDelay minus the display duration of the last video frame Display_period_last_AU preceding the splice out point SOP2 (i.e. display duration of the P-frame P6). Therefore, the decoding delay DecodingDelay(P9) for the P-frame P9 following the second splice out point SOP2 must be equal to the decoding delay DecodingDelay(Last Byte of B5) of the last byte of the B-frame B5 plus the display duration of the last video frame Display_period_last_AU preceding the splice out point SOP2. Combining the above two equalities, the decoding delay DecodingDelay(P 9) of the P-frame P9, which is the next anchor video frame following the second splice out point SOP2, must be equal to the SPMTE 312M required splice point decoding delay SpliceDecodingDelay in order for the second splice out point SOP2 to be seamless. In order for a seamless out point after a particular anchor video frame, (e.g. video frames I3, P6, and P9 of FIG. 2) the anchor video frame immediately following the seamless out point anchor video frame (e.g. video frames P6, P9, and I12 respectively) must have a decoding delay DecodingDelay equal to the splice point decoding delay SpliceDecodingDelay defined by the SMPTE 312M standard. It should be appreciated that the above encoding of a seamless splice in point also achieves the same decoding delay for I-frames. Accordingly, in an exemplary embodiment, the rate control processor 119 utilizes either the in point GOP allocation method or the following out point video frame allocation method to achieve the necessary decoding delay for an I-frame that both (i) immediately follows an seamless out point packet, and (ii) corresponds to a seamless in point. The rate control processor  119 in step 703 then identifies the next desired splice out point SOPm for the video signal. In particular, the rate control processor 119 in an exemplary embodiment receives splice out point configuration information that essentially identifies desired locations in the encoded video stream for seamless splice out points. Based upon this splice out point configuration information, the rate control processor 119 may identify anchor video frames (i.e. 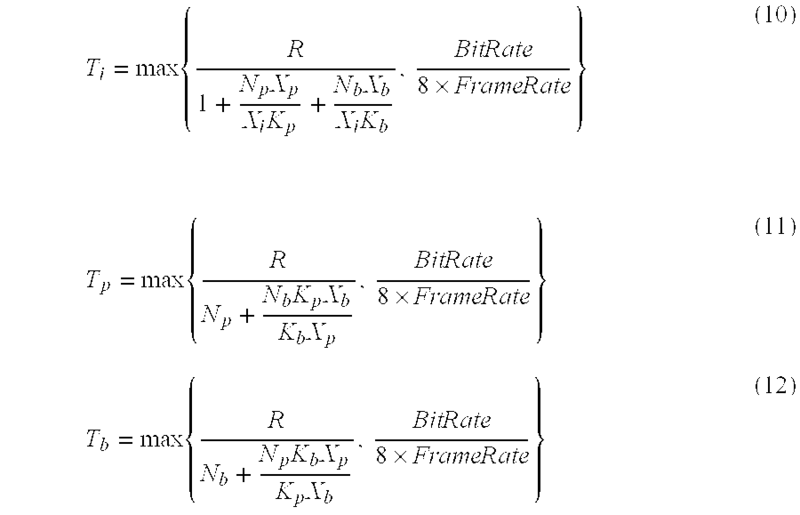 I-frames and P-frames) of the video stream that best meet criteria of the splice out point configuration information. For example, the splice out point configuration information indicates that splice out points should be placed at 1 minute intervals with several additional splice out points temporally concentrated about typical commercial break points of a television program. After identifying the next desired splice out point SOP m of the video stream, the rate control processor in step 704 determines whether the target number of bits T for the selected video frame F should be adjusted in order to achieve a desired decoding delay at a splice out point SOPm. More specifically, the rate control processor 119 in step 704 determines whether the selected video frame F precedes the splice out point SOPm in presentation order and is in the same GOP GOPn as the video frame immediately preceding the splice out point SOPm in presentation order. For example, as depicted in FIG. 2, the P-frame P6 immediately precedes the second splice out point SOP2 in presentation order, each of the video frames B4, B5, and P6 precede the second splice out point SOP2 in presentation order, and each of the video frames B4, B5, and P6 are a part of the same GOP as the last video frame immediately preceding the second splice out point SOP2. Accordingly, if the selected video frame F is one of the video frames B4, B5, or P6, then the rate control processor 119 would determine in step 704 that the target number of bits T for the selected video frame F should be adjusted in order to achieve the required decoding delay at the second splice out point SOP2. If the rate control processor  119 in step 704 determines that the target number of bits T for the selected video frame does not need adjusting, then the rate control processor 119 exits the out point video frame allocation method and returns to the rate control method 400 of FIGS. 4A-4C. Accordingly, if the target number of bits T for the selected video frame does not need adjusting, then the rate control processor 119 in executing the out point video frame allocation method essentially allocates the same target number of bits T to the selected video frame F as steps 414 and 450 of the rate control method 400. However, if the rate control processor  119 in step 704 determines that the target number of bits T for the selected video frame F does need adjusting, then the rate control processor 119 proceeds to step 706 in order to estimate a target number of bits EstimatedTarget for encoding the selected video frame F and the video frames between the selected video frame F and the splice out point SOPm in presentation order. To this end, the rate control processor 119 in step 706 initializes a target remaining number of bits RTarget. In particular, the rate control processor 119 in an exemplary embodiment initializes the target remaining number of bits RTarget by setting the target remaining number of bits RTarget equal to the remaining number of bits R for the current GOP GOPn. More specifically, the rate control processor  119 first calculates the target number of bits Target for the selected video frame F based upon the appropriate target equation (40), (41), or (42). Then, the rate control processor 119 subtracts the obtained target number of bits Target for the selected video frame F in order to obtain an updated target remaining number of bits RTarget before obtaining the target number of bits Target for the next video frame preceding the splice out point SOPm. After obtaining a target number of bits Target for each video frame from the selected video frame F to the splice out point SOP m, the rate control processor 119 in step 708 obtains an estimated target number of bits EstimatedTarget to encode the selected video frame F and each video frame between the selected video frame F and the splice out point SOPm. More specifically, the rate control processor 119 in an exemplary embodiment adds each of the obtained target number of bits Target obtained for the video frames together in order to obtain the estimated target number of bits EstimatedTarget. where SOPFrame# represents the encode/decode video frame number of the anchor video frame immediately following the splice out point SOP m.
where T 0 represents the target number of bits originally allocated to the selected video frame F in step 702. After obtaining the adjusted remaining number of bits T for the selected video frame F, the rate control processor  119 exits the out point video frame allocation method. Moreover, the rate control processor 119 in an exemplary embodiment returns to the rate control method 400 in order to obtain an appropriate quantization value Qstepj for the current pel macroblock MBj based upon the adjusted target number of bits T for the selected video frame F.
where BitCount represents the total number of bits used to encode the video stream up to the splice out point SOP m.
where NumStuffingBits represents the number of stuffing bits required in order to achieve the required splice point delay SpliceDecodingDelay for the splice out point SOP m to be a seamless in point. As stated above, the MPEG standard limits the number of stuffing bits which may be added. Accordingly, if the video encoder is unable to obtain the required splice point delay SpliceDecodingDelay, then the video encoder  114 marks the splice out point SOPm as a non-seamless splice out point. It should also be noted that if the out point decoding delay DecodingDelayOP of equation (46) is less than the required splice point delay SpliceDecodingDelay, then the video encoder 114 would also mark the splice out point SOPm as a non-seamless splice out point. It should be appreciated that the blocks of the video encoder  114 may be implemented with various hardware components such a digital signal processors, digital logic components, and analog components. Moreover, it should be appreciated that blocks of the video encoder 114 may be implemented with properly programmed general processors. For example, FIG. 8 illustrates a general processing system 800 which is suitable for implementing the video encoder 114 of the present invention. In particular, the general processing system 800 includes a processor 802, memory 804, mass storage device 806, video display 808, and input device 810. Moreover, the general processing system 800 includes a disk controller 812 for controlling the mass storage device 806, a video controller 814 for controlling the video display 808, an I/O controller 816 for controlling the input device 810, and a system bus 818. The system bus 818 operably couples the processor 802 to the memory 804, the disk controller 812, the video controller 814, and the I/O controller 816. The memory  804 includes random access memory (RAM) such as SRAM (static RAM), DRAM (dynamic RAM), and SDRAM (synchronous DRAM) which store software routines obtained from computer readable medium such as a floppy disk, CD-ROM disc, DVD disc, and hard disks. The memory 804 may also include nonvolatile computer readable medium such as PROM (programmable read only memory), EPROM (electrically PROM), EEPROM (electrically erasable PROM), and flash memory that store software routines. In particular, the memory 804 stores software and/or firmware routines which, when executed by the processor 802, cause the processor 802 to dynamically adjust the quantization used to encode a video signal in accordance with the rate control method 400. The processor  802 is operable to execute the software routines stored in the memory 804, and communicate with the mass storage device 806, the video display 808, and the input device 810 via the disk controller 812, the video controller 814, and the I/O controller 816 respectively. Most importantly, the processor 802 is operable to execute software routines of the memory 804 which cause the processor 802 to implement the functionality of the video encoder 114. While the invention has been illustrated and described in detail in the drawings and foregoing description, such illustration and description is to be considered as exemplary and not restrictive in character, it being understood that only a preferred embodiment has been shown and described and that all changes and modifications that come within the spirit of the invention are desired to be protected. For example, the video encoder  114 may simultaneously implement both the in point GOP allocation method and the out put frame allocation method in order to obtain an encoded video stream having both seamless in points and seamless out points. Moreover, the video encoder 114 may use the GOP allocation technique of method to achieve seamless out points at GOP boundaries. Furthermore, as eluded to above, video encoder 114 may use the frame allocation technique of method to achieve seamless in points. e) encoding said first plurality of video frames based upon said adjusted number of bits allocated to said first GOP. c3) determining said correction factor for said first GOP based upon said total bit adjustment, said remaining number of GOPs, and said number of bits allocated to said first GOP. determining prior to step d), that said first GOP is within a predetermined number of GOPs of said desired splice point. e4) encoding said pel block of said first video frame based upon said quantization value. e5) encoding said pel block of said second video frame based upon said quantization value. e) encode said first plurality of video frames based upon said number of bits allocated to said first GOP. determining said correction factor for said first GOP based upon said total bit adjustment, said remaining number of GOPs, and said number of bits allocated to said first GOP.